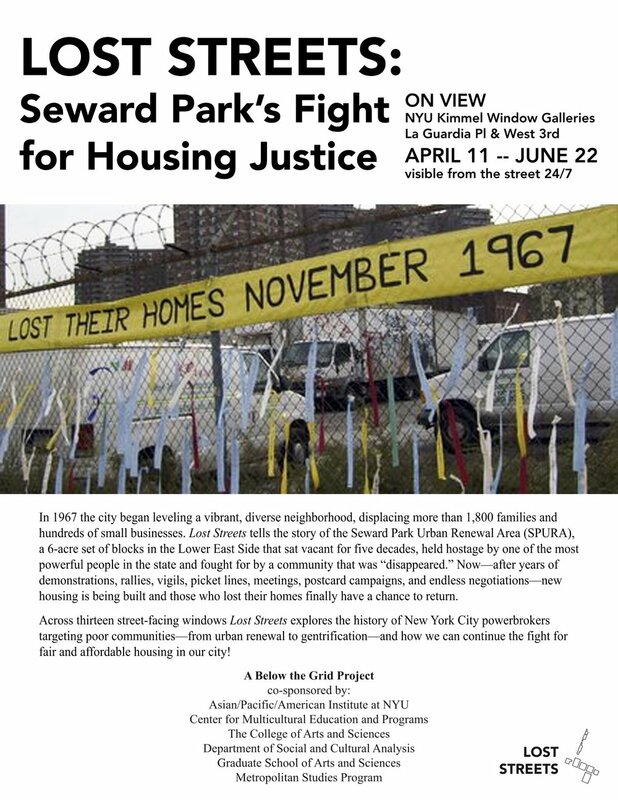 Lost Streets: Seward Park’s Fight for Housing Justice is on view at the NYU Kimmel Window Galleries on LaGuardia Place & West 3rd Street. The exhibit, which contains photographs, memorabilia, flyers, broadsides and news articles, chronicles the 50 year struggle to get affordable housing built on the Seward Park Urban Renewal Area (SPURA) site. Building on the site is currently in progress; the NYC Housing Lottery for the first mixed income housing development opened and closed and has garnered over 90,000 applications. On May 4, 2017, at 10:00am, participants in the SPURA struggle, including Former Site Tenants, will gather at the site of the exhibit, at W. 3rd Street & LaGuardia Place, and be available to speak to the press about the 50 years struggle, its culmination and what the next steps are. We invite you to join with us, and share our history and a cup of coffee. The collaborative creators of the windows will be there as well. In 1967 the city began leveling a vibrant, diverse neighborhood, displacing more than 1,800 families and hundreds of small businesses. Lost Streets tells the story of SPURA, a 6-acre set of blocks in the Lower East Side that sat vacant for five decades, held hostage by one the most powerful people in the state and fought for by a community that was “disappeared”. Now after years of demonstrations, rallies, vigils, picket lines, meetings, postcard campaigns and endless negotiations – new housing is being built and those who lost their homes have a chance to return. Across 13 street-facing windows, Lost Streets explores the history of NYC powerbrokers targeting poor communities – from urban renewal to gentrification – and how we can continue the fight for fair and affordable housing in our city. The exhibit is a joint venture of SPARC, Below the Grid Lab and the Kimmel Galleries. Co-sponsors include: The Asian/Pacific/American Institute at NYU; Center for Multicultural Education and Programs; The College of Arts and Sciences; Department of Social and Cultural Analysis; Graduate School of Arts and Sciences; Metropolitan Studies Program.